The Department of NSS at Sri Bhagawan Mahaveer Jain College, K. G. F. was started in the year 2005, with a strength of 100 students. Under the guidelines of Bangalore University, various activities were conducted by the NSS unit like tree plantation, Aids awareness programme and Crime Awareness programme with the collaboration of the Department of Police. Legal awareness programme was also conducted in collaboration with the Bar association. Visiting orphanages, old age homes, cleaning temple premises, repairing roads, visiting historical places and creating awareness about plastic free zones were the other activities taken up by the NSS Unit. In January 2015, five students were selected for personality development programme camp held at the Bangalore university campus. The NSS Officer, Mr. Jaya Pandian was selected as programme officer for this personality development camp. William Richards Higher Pry. School, Champion Reefs, K. G. F.
St Teresa’s Pry. School, Robertsonpet, K. G. F.
Sebastian’s Pry. School, Coromandel post, K. G. F.
Model Pry. School, Old Marikuppam, Andersonpet, K. G. F.
Numperumal Pry. School, Andersonpet, K. G. F.
The Annual Camp was inaugurated by Dr. Rekha Sethi, Principal, Sri Bhagawan Mahaveer Jain First Grade College, Robertsonpet, K. G. F. The highlight of the camp was the Aids awareness Programme conducted by Prof. Roselin K., Dept. of Life Science. The aim of this programme was to create awareness among the youth regarding the ill effects of Aids and the various measures taken by the Government of Karnataka. Personality Development Programme was conducted by Mr. Manjunath, Govt. First Grade College, Guttahalli, Bangaruthurupathi. Dr. Manjula B. K. HOD, department of Kannada, SBMJC, K. G. F. gave an enlightening talk on the Role of Language in Communication. Adima and its cultural activities carried in order to improve the stage programme and to encourage the youths to take part in the activities and to improve the drama artist by Mr. Munishami. Cultural value By Gollahalli Shvaprased, writer in Kannada, the importance of cultural acitivites that influences our life style. On August15th 2014 Independence day was celebrated in the college. The NSS officer. Sri.Jaya pandian & Mr Udyakumar, Physical Director, NSS Volunteers, Teaching and Non teaching staff members were present. The flag was hoisted by Dr. S Shabbeer Basha, Prof. HOD of Hindi, SBMJC, KGF. On this occasion various Cultural programmes were organized and sweets were distributed to the volunteers. On 25/08/2014 – Along with the private Doctors Association and NSS volunteers with the hands of KGF City Municipality Office bearers NSS students of SBMJC GEETHA ROAK Robertsonpet KGF assembled at municipal office and went for the procession start in from Municipal office Soorajmull Circle, went around Prichard road, Swarna kuppam, Geetha road to Soorajmull circle to bring awareness among the public of KGF to stop spitting, lilting and throwing of garbage at public places and maintain cleanliness and keep the environment clean, ban on smoking at public places. On 30/08/2014-Seminar was organized on the topic Human Values the resources person was Purusotham State Bank of Mysore, Robertsonpet Branch and Mr.Basavaraju Manager of Pragathi Graminar Bank Robertsonpet Branch KGF. All NSS volunteers, The principal of the college Dr. Rekha Sethi and staff members were present. On 16/12/2014-The programme was conducted by the KGF advocate Association. President Sri. S.A.Harinath, Vice President, Sri.Gopi, General Secretary and Sri.B. Manivannan was present. The program me was presided by Sri.R.P.Nandesh Honorable judge, Jr.Division and Additional JMFC KGF, Sri S.J.Krishnan Honorable judge Additional Senior Civil Judge and the Principal JMFC, KGF.The program me was organized to create legal awareness’ among the students various issues like how to get registered birth certificates what or the consequences for violating the law was discussed by various advocates in this program me. Dr.Reka Sethi Principal of SBMJC, Sri.Mahander, Chief Accountant Officer of SBMJC and Staff members were present. On 26/01/2015-Republic day celebration the chief guest of the program me were Dr.Manjula HOD dept of Kannada the NSS volunteers and the staff members of the college were present. Various cultural program me were organized. 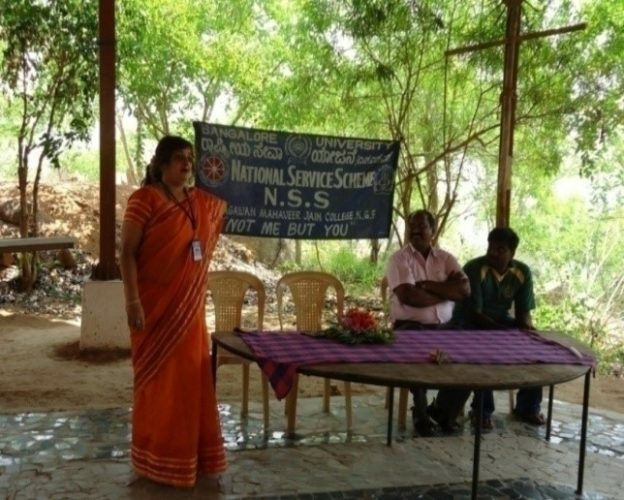 On 4/02/2015-Aids awareness program me was conducted by NSS Dept. to all the student of SBMJC in order to create awareness among the youth of the college and the conquesnces of the Aids was spoken by Prof. Rosilin K from the Dept of Bio-Technology of SBMJC. On 14/02/2015-Sharamadhan was done at Gommankahalli Andersonpet cleaned the village and Temple premises with the NSS Volunteers and created awareness among the villagers about cleanliness and growing of plants. On 27/02/2015- Blood Donation camp was organized jointly by General Hospital Robertsonpet, KGF and donated the blood. Dr, Shivakumar District Surgeon of KGF General Hospital and Dr.Meenashaki Blood bank officer of BEML Medical Center and Dr.Reka Sethi Principal of SBMJC were present.total number of units blood donated was 65 units more than 150 student took part in this camp CAO of SBMJC K G F Sri Mahendhar Kumar Munoth were present .